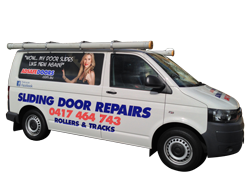 When it comes to sliding door repairs in Sydney the sliding door track repair is one of the most common ones. The number of times we field a phone call asking ‘How do I fix my sliding door track?’. When we have a look at sliding door repairs that need to be done, the very thing that is holding the door up and keeping it on the track is the track. Now, over time there’s a lot of grime, dust, dirt and different things get into the track, and cause a lot of friction as the door is rolling across it. A lot a people just ignore this and continue dragging it instead of taking some time to clean the track. So your first port-of-call is definitely to clean the track, just to see if that can roll a little bit better. Unfortunately, many aluminium and glass sliding doors are so far gone that they actually have damaged the track. This is what you’ll find when you can’t move your door. When it becomes near impossible to move, the track is highly damaged and likely, the rollers have also been damaged, cracked or split, as a result, and therefore they cannot roll smoothly anymore. 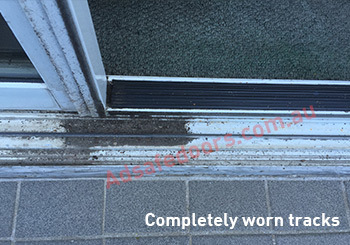 Our sliding door track repair service is very straightforward. First of all, we like to talk to you, just to see exactly what is going on. Most of the time we can diagnose the problem over the phone. Once you tell us the type of door you have, whether it’s a sliding door, a glass door, an aluminium door, or if it’s a wooden rolling door, then we can ask you a few questions about the tracks and the rollers, and the door handle, just to qualify exactly what type of door it is. We will then be able to tell the weight of the door, and the type of rollers that are needed to look after that door. A lot of the time the springs within the rollers have disintegrated, or totally gone, as a result of normal wear-and-tear, and that’s what makes the door so heavy, and scrapes along the track. What we want to do is repair the rollers, make sure the springs are in great working condition, get brand new springs in the rollers, and have the rollers that are high-quality stainless steel, and then we repair the track as well. Once we have done that, you’ll find the door can be pushed with one finger, open and closed, with ease. Give our team at Adsafe Doors a call today. We’ll ask a few questions, clarify exactly what needs to be done, and we’ll provide you with a quote over the phone so you know exactly what’s going to happen with your door repairs. If we can not fix it, we’ll let you know straight away.